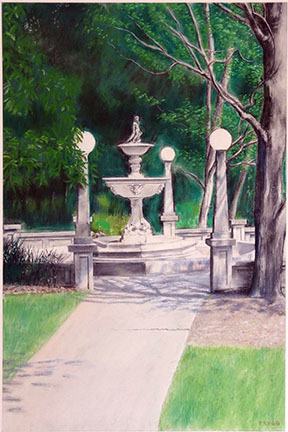 Fine artist Leif Trygg is ready to unveil two new pieces in his Ashland series: the Butler-Perozzi Fountain in Lithia Park and a landscape view of a path in the 93-acre park itself. Both are rendered in lively pastel colors with a combination of fine details and muted suggestions in the Impressionist style. These pictures join five other completed scenes from Ashland – Ashland Creek, Lithia Park bridge, Japanese Gardens, the lower duck pond and a colorful sunset. In addition to these pictures, Leif will be showing smaller, more personal pieces as well. A work-in-progress will also be on display to help the public understand the process he uses to create these images.